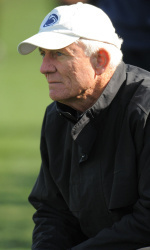 Head coach of the men’s soccer program Barry Gorman unexpectedly announced his resignation Monday. He leaves a legacy of 22 years of coaching and three Big Ten titles in his wake. Citing “personal reasons,” he has left the team to a nation-wide search for his successor. Mark McColey is a Senior majoring in Advertising and Labor-Employment relations. Among his loves are Penn State Football, The Steelers, The Penguins, The Simpsons, Tina Fey, and Arrested Development. Perhaps panic isn’t the most appropriate response, as Talor Battle’s decision not to hire an agent leaves the door open for him to return for his senior season, but it’s never a good sign when the heart and soul of your basketball program explores alternatives to being the heart and soul of your basketball program. Black Shoe Diaries points out that it’s common for players to submit their name for exploratory reasons, only to withdraw and return for their senior season. But if Battle likes what he finds, it’s unlikely half-brother Taran Buie will remain a Nittany Lion. But that’s something to worry about later. Battle has until May 8th to withdraw his name.